About a month ago, this piece by me appeared as a guest post on Personal Development, One Mind at a Time, but it has never appeared here. It’s your Friday bonus post. Nothing is more depressing to me than not know what to do next — whether that means not knowing which tasks to do next today or not knowing what path to follow with my life. I don’t have a real job, and one of the problems with not having to get up at a specified time, report to a certain person or achieve a sales goal is not knowing what to do next. And that happens on two levels. First, there’s not knowing which of the many things I could be doing that I really should be doing now. I’m not even sure when I should be having fun and when I should be working. I can visit a museum at 10 a.m. and write blog posts at 10 p.m. I can work on my bookselling business (most of my income comes from online used bookselling, something I’ve been doing since 2003) at any hour, and I can watch a DVD whenever I want, too. Second, something much bigger looms over me. Since there’s no predefined career path that comes with what I do, I’m never sure what the next step is. I’m stuck as a bookseller since 2003, and I’m stuck as a blogger with few readers and no income from blogging for nearly a year. I was once a professional writer — making a little money doing it — but any contacts or credibility I had are long gone now. What comes next? When is it time to get to work? When has a task taken too long? When has a career lasted too long or stalled out? I’m not an expert on motivation, but each day I manage to get through the uncertainty of not knowing what comes next. Here are three ideas for you that have kept me from falling off a cliff when I fall off the wagon of productivity. Do something you have to do anyway. 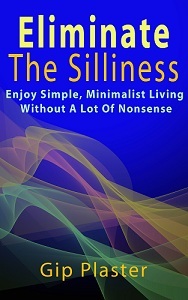 Idleness seems to be breed idleness, so press yourself into usefulness by doing something that you have to do anyway. You need to do the laundry anyway. The dishwasher needs loading anyway. Your overflowing inbox needs clearing out anyway. You need to take your daily walk anyway. You know what else you need or want to do. Perhaps you don’t really need to do anything, but your life will be better if some tasks are done, and now is as good a time as any to do a couple of them. Doing something — anything — seems to push brains into the right mindset to do something really useful. Today’s inspiration might come while you’re doing one of the things you really needed to do anyway. Even if it doesn’t, you’ll end the day with a sense of accomplishment because of work well done, not a sense of despair from being stalled out again. Most people meditate, but lots of them don’t know it — and very few of us use it to its full effect. Meditation can become an escape from the realities of your situation, but used well, it’s a tool that leads you toward greater productivity. Two things get my head spinning: Having too much to do and having too little. When I can’t decide what to do next, I spin like a corkscrew into the ground — feeling bad mentally and eventually physically. When I have too many things I want to do, I feel like I’m spinning so fast anything I touch will get flung into orbit before I can complete it. Meditation helps with both problems. For me, it’s stretching out on the bed, closing my eyes and allowing my body to simply rest as my mind processes through all the possible actions and outcomes. After a few minutes, order takes over the chaos and a path appears. Walking through a park works for me, too. For you, it might be intense exercise, a familiar ritual or a prayer you remember from childhood that takes your brain into a place that isn’t easily reached. Choose one, then go ahead. Whether you’re talking about a life path or a pile of things that need doing, choose one, then get busy. There isn’t one right choice. More than one path will lead you successfully through your day. And more than one path can lead you into a life that’s far beyond your imagination. There’s never a need to turn back. If an action or a path isn’t serving you well, consider it complete and move on to one that works better. Don’t go back and try again. Try going forward and taking advantage of the opportunities available from your new position. Ultimately, you can do anything you want. You don’t have too few things to do today. And you don’t have too many. Whatever you choose to do right now will work just fine. When you carefully, mindfully, deliberately choose to do something, you can’t go wrong. Then, reap the reward of a productive day and a productive life. I can certainly relate to what you write. It is so easy to have a routine job with office hours, guaranteed income and a mundane existence. Being your own boss is an absolute killer as it is you who are to blame when nothing happens or there is no income. I owned and operated a backpacker hostel for 4 years. Although the life style was superb, the lack of income was downright frightening even though I did everything possible to correct the problem. The biggest problem that I faced was meditation on all the wrong things. A long walk on the beach and physical activity helped a lot but the challenge was to get my head straight. I wish you strength and success in your persistence. I think avoiding a mundane existence is pretty much the meaning of life! Being your own boss is challenging, but I’d rather be challenged than bored — and my desk jobs were always tedious and boring. If there are any good desk jobs, I don’t know about them. Good comment. I’m glad to have you around, Andre. It sounds like you actually do know what to do next, and are doing so. As another self-employed person, I so resonate with what you’re saying. The piece about just jumping in somewhere and doing what you need to do anyway is right on. And you’ve just inspired me to go meditate! I’m glad to have you around, Jacki. I can tell you’ve recently read a few of my posts. I’m also looking forward to your guest post here. I haven’t forgotten, and I’m ready for it whenever you can get to it. You do a great job on your own blog. I needed to read this right now. I’ve been stuck in a rut for well over a week now and I think this little nudge is helping me get over it. Thanks man. Thanks, Sam. Actually, I’ve been in a rut myself this week… lots of wheel-spinning. As I said, this post was written a month ago — and I scheduled it a week ago — but it comes as a good time for me, too. I’m not at all sure I’m on the right track, but I’m doing something. I know this post was intended for the unemployed or self-employed, but the lessons apply to everyone. It’s easy to fall into the comfortable rut of a regular job, or the brain spinning busy-ness of life and loose sight of “what’s next.” Just doing one thing leads to doing the next thing and so on and suddenly you are productive and feeling better. As for meditation, I often find it very difficult to do quiet meditation because my thoughts interrupt me. Something that works very well for me when my brain is spinning out of control is Suduko of all things. I force myself to focus on the numbers, the possible solutions, and nothing else. It reigns my brain in and helps give me some clarity to refocus on my life. all I can say is…. Exactly! The important thing to remember Gip is even if you are not quite sure where your life is heading at the moment (it will change-it always does), at least you are not sitting idle. Even when you are not moving (as in meditation) you are clearing your mind so that you can think clearly. Sometimes we just get stuck with our wheels spinning and it seems like we will never break free, but you have a determined spirit and that will lead you to somewhere and everything will be okay. Donna, I think sudoku would lead to a whole new kind of frustration for me. I’m not very good with numbers. I do find certain activities, like listening to live music, can help order my thoughts. Jan, thanks for the encouraging words. I’m glad to have you commenting here. You always have something good to say.